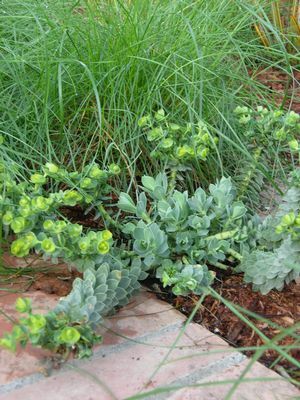 Euphorbia myrsinites (donkeytail spurge) is an evergreen perennial. It has thick stems that trail along the ground and grow to about 12" long. 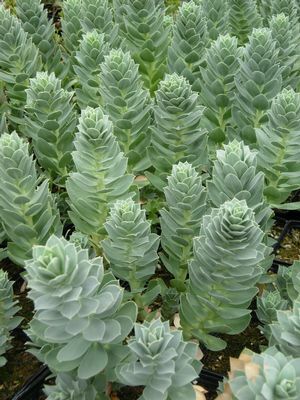 Stiff blue-gray leaves with pointed tips are arranged in spirals along the stems. Flattish clusters of chartreuse flowers bloom on the end of the stems in later winter-early spring. Plant in sun or light shade. Donkeytail spurge is tolerant of most soil types including clay. It can tolerate dry and moist soils, but doesn't like to be waterlogged for a long time. Once established, donkeytail spurge is drought tolerant and will survive on cooler coastal areas with no extra water in the summer. In hotter inland areas, it will look better with occasional water in the summer perhaps every 2-3 weeks. Donkeytail spurge is a tough plant that tolerates heat and is cold tolerant down to 10°F. As the older stems mature, they start to lose their leaves and beging to yellow. Cut them out at the base when this happens. New shoots sprout from the central crown to take their place. When handling plants or pruning them, wear gloves and take care not to get the white sap from the stems on your skin. The sap's a strong skin irritant. If you get it on your skin, wash it off straight away and don't touch your face or your eyes. If you get the sap in your eyes, go to the emergency room.